If you are in need of a cake to make for Valentine’s Day, look no further. This layer cake is super simple to make and assemble. 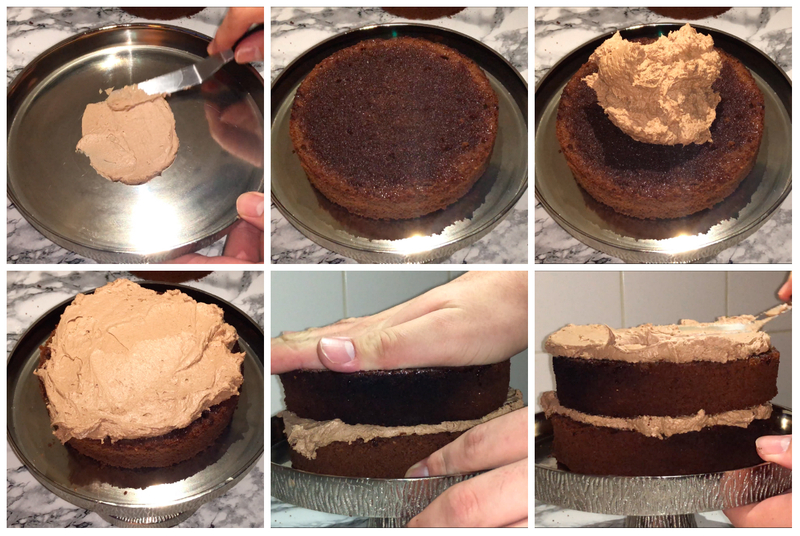 The cake is made-up of three layers of chocolate sponge cake, which are brushed with simple syrup, then filled and finished with the same Nutella Italian buttercream (which is a smoother and creamier buttercream, less sweet then basic buttercream). 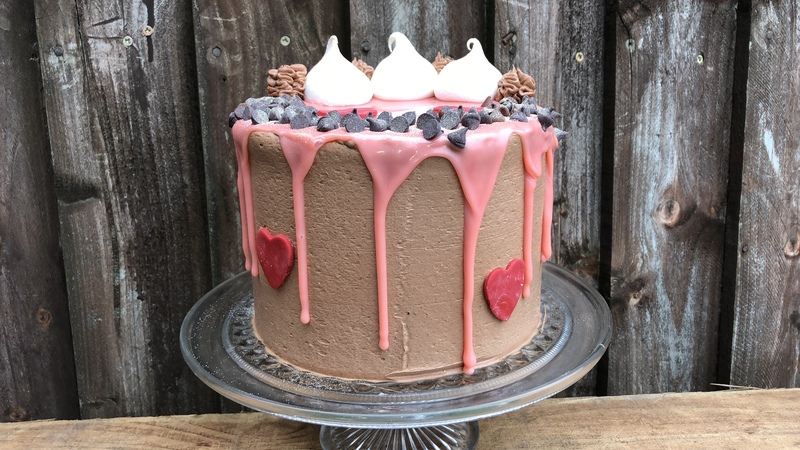 The cake is then finished with a white chocolate drip, meringue kisses, chocolate chips, edible glitter and sugar paste hearts. Of course, you can personalise the cake to suit you or the person you’re giving this too, it’s really up to you. In place of the finishings I used, feel free to us chocolate, fresh fruit and/or flowers. Before you get into the cake making, you’ll want to do some prep. Start by weighing up all of your ingredients, preheating your oven to 180˚c/350˚f and lining your tins, if you decide to. Once all the prep is done, you can get on with making the cakes. 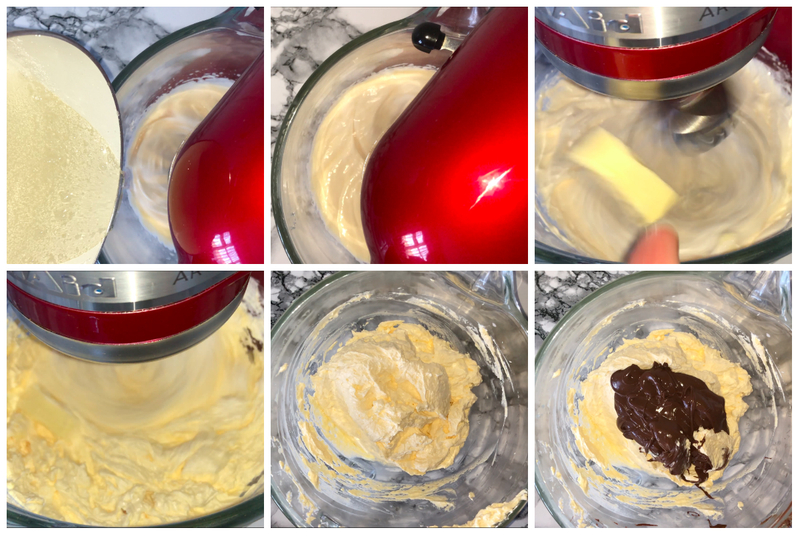 Place your butter and sugar into your mixing bowl of choice (I opted for my stand mixer, but feel free to use a bowl and a hand mixer) and then beat the two together until they are well combined and have become lighter and fluffier in colour and consistency. Then add in your eggs, one at a time, beating well in between each addition. If you notice your mixture is starting to scramble, don’t worry. You can fix this by adding a small amount of your weighed out flour. Now that the eggs have been fully worked in, stop the mixer and give the bowl a good scrape down, this is just to incorporate any bits that may not have been fully worked in from earlier on. Then add in your dry ingredients, passing them through a sieve first to remove any lumpy ingredients (cocoa powder can be quite lumpy). Start to incorporate the dry ingredients on a low speed to start and as you see them beginning to incorporate, you can higher the speed from low to medium-high and adding the milk in increments, this is to help with the consistency of the batter (Try not to over-mix the cake batter once the flour is incorporated, otherwise this will result in a tough textured cake). Divide the cake batter between your 6 inch cake tins, I weigh the cake batter and divide it as equally as I can using digital scales but if you don’t have these type of scales, feel free to eye ball it and roughly estimate the amount in each cake tin. 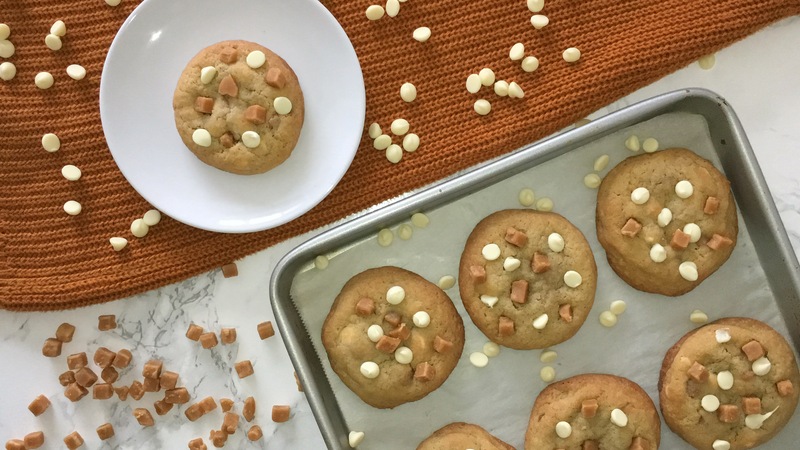 Smooth off the tops of the cake batter in the tins then place on the middle shelf in your preheated oven and bake for 25-30 minutes (or until a tester comes out clean). While your cakes are in the oven, you can go ahead and make your Italian buttercream. I personally like this buttercream more than your standard buttercream as it’s smoother, more buttery and less sugary/sweet. To start the buttercream, get yourself a small saucepan and place in the water and granulated white sugar, then place onto the hob over a medium-high heat until it reaches 121˚c/250˚f. Make sure you keep an eye on the temperature, don’t allow it to go above or below the required. While your sugar and water comes up to heat, place your egg yolks and whole egg into a mixing bowl (if you’re using a stand mixer, use the whisk attachment for the best results) and whisk them together until they are very well combined, you will be able to tell one the volume has increased by 3 or 4 times what it was initially and it will be paler in colour. Once the sugar and water has come up to temperature, you can then add it into the egg mixture. Turn the speed of your mixer down to low and slowly pour the hot sugar mixture in, try not to get it down the side of the bowl, if possible. Once all of the sugar mixture has been added, turn the speed back up to high and whisk for a few minutes until the mixture has cooled down. You’ll be able to tell when the mixture is cooled enough, by touching the bottom of the bowl with the back of your hand. If it isn’t too hot for you to handle, you can start adding your butter, if it’s too warm, continuing whisking for a couple of minutes. Once the mixture is cooled enough, add the butter a little at a time, whisking in between each addition. 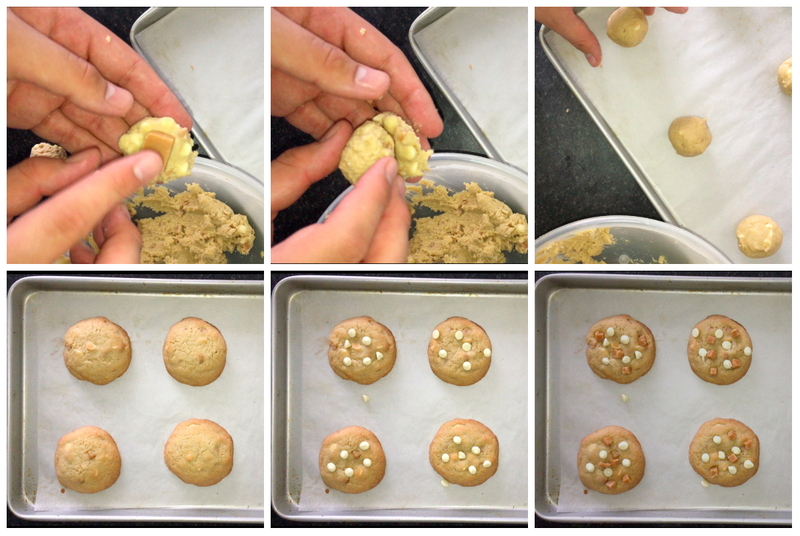 Make sure your butter is fully worked in before you stop the mixing process. Give the bowl a quick scrape down, then add in the Nutella and cocoa powder, give a good mix to incorporate. Once they’ve been fully worked in, give the bowl another good scrape down. You can then set the buttercream aside or place in the fridge until you need it later on. I also recommend making your simple syrup at this stage, as it will give it time to cool completely before using. To make the simple syrup, you’ll want to place equal amounts of granulated white sugar and water into a saucepan and allow it to come to a boil, then remove from the heat and allow to cool before you intend on using it. 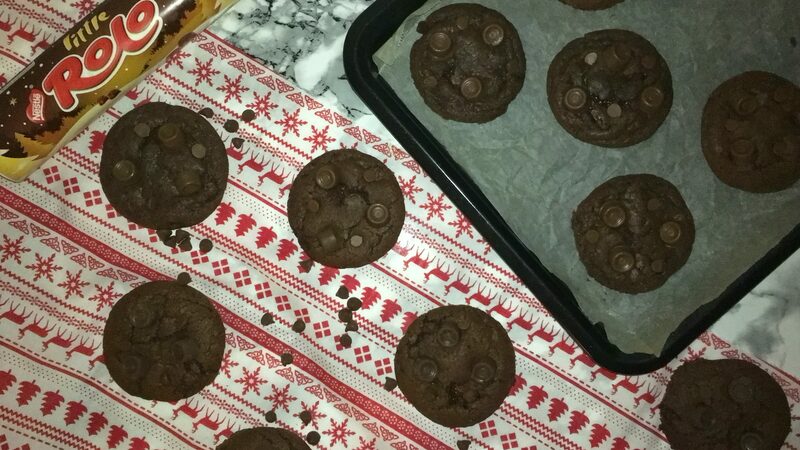 Once your cakes are fully baked, remove them from the oven and allow them to cool completely before you try to trim them. Now is the perfect time to wash up all your dishes and utensils that you’ve used. Once everything has been made and is cool and read to use – you are now ready to assemble the cake. So get all the separate parts ready and grab yourself a cake stand or plate! Start by getting your layers of cake and level the tops of them using a cake leveller (or a serrated knife works equally as well) and generously simple syrup each layer. Set the layers of cake aside while you prep the stand – to prep the stand you’ll want to get your cake stand/plate of choice, then place a small blob of buttercream and spread it out using a offset spatula and place your first layer on cake onto it and press it into place. Top the layer of cake with a good amount of the buttercream and repeat this with the remaining cake layers. Once all the layers have been sandwiched together, you can give the coat a crumb coat. 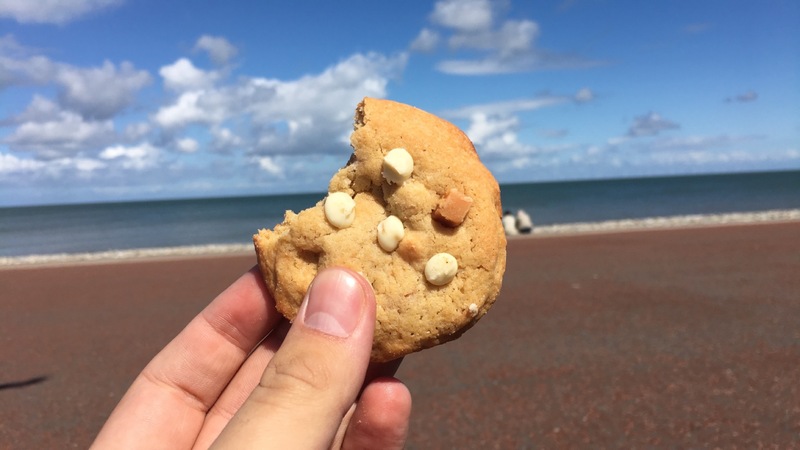 A crumb coat is a thin coat of icing which locks in all the crumbs so they don’t appear in the final layer of buttercream – once you’ve applied the crumb coat you can then set it in the fridge for a short while, just until it firms up. 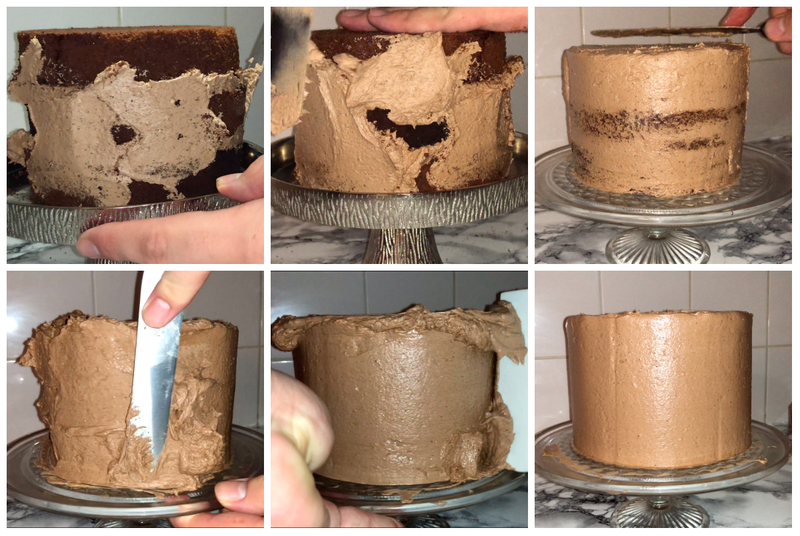 Apply the final layer of buttercream and get it as smooth and perfect looking as possible – using a palette knife to spread the icing on and a scraper to smooth and level out the icing (watch the video for a more detailed view on it). You can then make the white chocolate ganache, which will be used for the drips later on. So, the ganache is really easy. 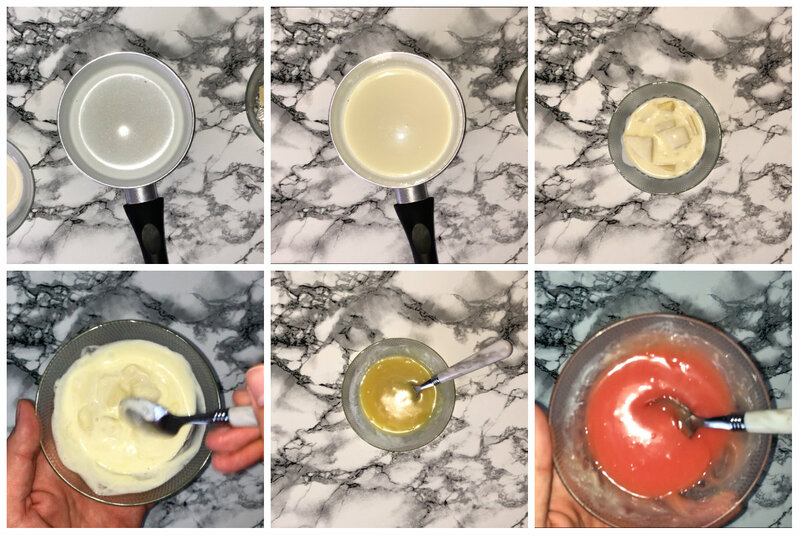 Place your double cream into a saucepan over a medium heat and bring almost to a boil, then pour over your white chocolate and allow it to sit for a minute. You can then start to stir it together using a teaspoon or a small spatula until its smooth and has come together, it will have changed colour to a yellow-ish tone but don’t worry, once you add the food paste it will change. I used Wilton christmas red and it came out the perfect tone of pink for my cake but feel free to use pink food paste. Take a teaspoon of the white chocolate and drip between 1/4 and 1/2 of it down the cake, repeat this all around the cake. For a visual effect, alter the length of the drips by making some longer and other shorter but feel free to make it suit you and your occasion. To finish the cake, I place a few meringue kisses on top, then pipe some of the remaining chocolate buttercream at the sides of the meringues, then around the remaining exposed edge, I generously sprinkle a mixture of milk and dark chocolate chips and finish those with a sprinkle of edible glitter and for the spaces on the top and side I add a few sugar paste heart cut outs. This is how I opted to finish my cake but feel free to make your cake suit you and your occasion. I will leave all the ingredients below, for those interested in making this recipe . 300g Granulated white sugar . 2 1/2 tsp Baking powder. Red or pink food colouring paste. I used meringue kisses (recipe coming soon), chocolate chips, edible glitter and sugar paste hearts but you can use whatever you like.